To provide quality nature-based interpretive programs and services for City of Alexandria residents and aid in the management, conservation, and protection of Alexandria’s natural resources through informative recommendations and conservation projects. The Jerome "Buddie" Ford Nature Center offers a variety of nature-based interpretive programs and services for City residents. Programming is conducted on a citywide basis by a small staff of professionally trained Naturalists. The Nature Center also contains interpretive exhibits on the natural history of the local area, with a focus on Dora Kelley Nature Park. 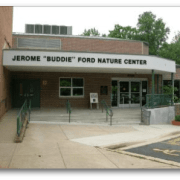 Would you recommend Jerome "Buddie" Ford Nature Center?